Animal Shelter Euthanizes Cat Too Soon? Cat killed by shelter in breach of ordinance? A Pickens County, South Carolina woman is grieving over the fate of her lost 17-year-old cat, who was euthanized at the shelter after the cat went missing. Kelli Gandy, a Clemson resident, was worried about her cat when it went missing for the first time. Kelly had adopted the cat at a young age, and it would follow her around like a dog. In less than 24 hours, her cat was euthanized when it wound up at the shelter. Pickens County Animal Control said the cat was very sick and malnourished. Here’s a video where news media spoke with everyone involved (as at June 1st 2015, the video is no longer available – sorry). As it turns out, the Pickens County shelter may or may not have violated state law as pertaining to the hold on animals brought into the shelter. SC law states that all stray animals must be kept for a period of five days, after which time they may be legally euthanized or adopted out. Should a cat be wearing identification such as a collar, Animal Control is supposed to hold the cat for 10 days. The cat was deaf, and old. Kelli says her cat wasn’t malnourished and had food available to her at all times. WSPA7 stated in their report there is no exception to the five day hold, that all animals must be held as required by law. I did a bit of digging and found the shelter may have had the legal right to euthanize the cat. According to SC animal law, the law may not have been broken in this case. Under Article F (http://www.animallaw.info/articles/dduspetadoption.htm ) there’s a clause that read…..
Kelli has plans to meet with Administrator Hurst on August 12. She also plans to attend the next Pickens County council meeting later this month. In the meantime, Kelli and her family are heartbroken at the death of the cat they’ve had for so long now. “We had no say whatsoever. We didn’t get to say goodbye. Nothing. Nothing. Now we don’t have her anymore,” Kelli told WSPA7. Should a shelter have the right to euthanize a cat without informing the owner? It’s scary to think a cat or dog turned into a shelter in poor condition is subject to euthanasia if that animal is determined to be sick or in pain. Shelter administrator’s apparently do have the right to euthanize. That still doesn’t make it the right thing to do. Don’t get me wrong. If an animal is in extreme pain and no owner can be located, that’s different. It’s sad that Kelli never had the chance to say goodbye to her cat. How does everyone else feel about this case? I’d suggest each of you check the laws in your state. I was totally unaware this is how SC deals with sick animals left at the shelters. This may be true in other states as well. This entry was posted in Euthanasia and tagged Animal laws, cat shelter, euthanasia, euthanasia of cats by Michael Broad. Bookmark the permalink. I’m elderly & my two cats are getting there. If they INSIST on euthanizing people’s pets, the only KIND thing to do is to euthanize the owner of the deceased cat too! In no way is that cat deserving to be killed, & her owner didn’t deserve to be made to suffer such grief! So if euthanasia is a “kindness” put the owner out of their misery!!!! If it were me, I’d play Ferguson & make the cops shoot me. A cool comment. Thanks Cathy. Your writing is not ‘elderly’! Is the picture of the cat shown above the cat that was in fact euthanized? If so, it is obvious the cat is soaking wet. Was the cat trapped by someone and brought in to the shelter? How did the shelter obtain the cat? What qualifications did the shelter supervisor have to properly determine in the short time they had the cat that it was “sick and malnourished?” Obviously this determination was not made by a trained veterinarian. If the cat in the picture is indeed the cat in question, it is standing up – therefore presumably could not be that “sick.” Many cats at age 17 can be hyperthyroid or in renal failure or have heart problems or cancers, but they can sometimes live a good while with medications, even though they may not be as hale and hearty as they one were. Did they offer this cat food to see if it would eat? Some elderly cats become bone thin in their old age, just like people, but nevertheless go on living a long time quite happily. And why didn’t the shelter make any kind of effort to find the owner of the cat, especially knowing it was elderly and perhaps someone’s beloved pet? Couldn’t they at least have posted a sign where the cat was picked up? This is just typical of the uncaring attitude of so many municipal kill shelters. Well, it doesn’t look like a candidate for immediate killing to me, Elisa – I see no nasal discharge, eyes appear clear, she’s apparently able to stand up OK. Do we know how she got to the pound? In a trap or brought in by someone? Maybe she was trapped and left out in hot sun and got dehydrated? A few years ago a couple I know were hospitalized one after the other within a couple of days. There was a bit of a feud with their neighbors because they’d reported the neighbors dog being loose and killing goats and chickens. So the neighbors took the opportunity to get back at them and trapped their cat while they were in hospital and took him to the pound after leaving him in the trap in July weather from Friday to Monday. He fortunately survived, the wife came home and found out, and I was able to spring him from pound in time. He was a young cat, but lost quite a bit of weight during his brief ordeal. No word as to how the cat got to the shelter. This happened a few weeks ago during the time we had daily thunderstorms. That would explain the cat being wet. But Elisa, you know you don’t normally see a cat soaking wet, even in stormy weather – they find somewhere to hole up to keep dry. The cat was either left in a trap and got wet, got rained on while in a trap in an open vehicle being transported to shelter, perhaps, or was bathed or hosed off at the shelter . . .
Good thinking. That sounds plausible. I think you are probably right, Pam. Hi Pam, that is the cat and he/she is soaking wet as you say. That was probably the only picture they had to hand. She just looks like an old cat to me. Certainly not a reason to circumvent the clear rules. Michael, Elisa – do we know if it was the owner’s picture, or was it a picture taken by the shelter? I went back to the actual article and it doesn’t say he provided the photo. It does sound a lot like the cat was left in a trap to get wet. There are a lot of people in SC who trap cats and take them to the shelter. It also doesn’t tell how the cat escaped. I can’t imagine a cat that old being allowed to roam freely. There are too many wild animals, as well as dogs. Pickens County has a lot of country settings. Except for around the university Clemson is also rural. Thanks for that research, Elisa. If he was trapped by a neighbour and allowed to get soaked through in the cold water and thereby look ill the person who trapped him is culpable too. I don’t like people who trap neighbour’s cats. It is a horrible thing to go and can lead to the cat’s death at a shelter. Crappy behavior as far as I am concerned. Oh how I hate them – I hate these shelters who don’t give animals a chance. Me too Marc I despise them! I can attest to the fact that our kill shelter in no way adheres to the wait period they are supposed to. As stated above, there is a clause built in that gives them the go ahead to euthanize if they deem the animal to be sick. Here, no shelter animals are medically treated even for a simple respiratory issue that could easily be taken care of. They automatically go to “the blue room”, as they call it. These decisions are made by uncredentialed staff. A vet never sees the animals. I really feel for this woman. I raised a kitten to live to the age of 21. In her old age, she looked scruffy and thin but was going strong until the end. If a vet had seen this woman’s 17 year old, he may have realized that this was just a case of old age. I’ll bet that I wouldn’t look so good either if I were as old in years! You paint a picture of callous, factory killing. I find it disturbing. I suppose they would say they have no choice but to euthanise so promptly because of the numbers of unwanted cats. I am not convinced that argument is a good one. The only way I know how to describe most of the shelter workers I have had contact with is to say that they have “dead eyes” – no emotion or expression. I’m not sure why that is. It may be that they have developed some kind of coping mechanism to deal with all the horrors around them. This is so awful! To have an old cat go missing and find out she’s been killed by the very people who are supposed to care about cats, must be heart breaking. Their dead eyes may be a coping mechanism but it sounds to me like the description of a slaughter house where people work who have no feelings at all for animals, some even abuse them before they kill them. I don’t think we know the half of what goes on in these places. I agree. It seems to me that some USA shelters have lost their way. The word “shelter” no longer has a meaning for them. It is a misdescription. I have thought this for a long time. They should re-invent themselves and describe themselves as something different. There urgently needs to be a widespread education campaign across the whole country about responsible cat caretaking and the importance of neutering and that taking on a cat should be a lifetime commitment. I wish someone over there would start a USA version of our Cats Protection. I think my follow-up article sums up the problem as it includes reference to rendering the dead bodies of euthanised cats at shelters for the pet food industry. That single horrific fact single handedly prevents eliminating the unwanted cat problem because business wants the carcasses of unwanted and euthanised cats. It is profitable to have unwanted cats roaming around. I heartily agree!!!! Could you post the link to your follow up article on here? I would love to read it! Also, there is a campaign called saving 90 – website is http://www.saving90.org – I don’t know if you’ve heard of it, but you seem like the type of person who would be interested. The basic goal is to reform shelters to save at least 90% of animals that walk through the doors because less than 10% are too sick or aggressive (in the case of dogs) to be saved. Thank you Lily. Yes, you are correct, I am a passionate advocate for improving the adoption rates at shelters through imagination and enlightened thinking. I will check out the website that you have told me about. I may even right of the page about it. It’s always about profit instead of about the welfare of cats. What a sad sick state of affairs! This appears to be yet another example of shelter personnel who do not really care about animals. The rush to euthanise is testament to that. The administrator’s words ” I’m not worried about what the ordinance says. We have a right to make a decision of what’s in the best interest of an animal.” speaks volumes as to her attitude. She appears to be be saying that she has the right to make a decision irrespective of the ordinance. The ordinance says an animal may be put down before the expiry of the prescribed waiting period ” when an animal is extremely sick”. Being thin is certainly not extremely sick. Not enough importance was given to finding the owner or even seeing if it was adoptable. The rush to get rid of it was the over-riding concern. 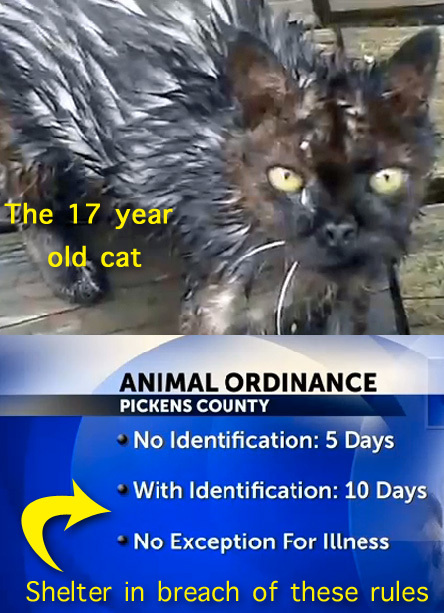 It would be interesting to hear what “sickness” was diagnosed so quickly by Pickens County Animal Control, and what proof do they have? These are 3 points that seem to demolish the case for immediate ethanasia. I totally agree, Harvey. The shelter is too keen to kill. They seems to have got used it. They have lost their sensitivity to treating each cat as a sentient being to be saved. They probably thought the cat would never be rehomed so why bother and ignored the law. They also ignored the sensibilities of the cat’s caretaker. My initial assessment is that this cat was killed to soon. I don’t think the shelter supervisor made an objective assessment of the cat’s health. He appears to have ignored the cat’s age. Old cats can be skinny but not malnourished. The owner says her cat was OK health-wise. I would prefer to trust her assessment. Anyway the law seems to be unclear. Elisa says there is a loop-hole, a get-out clause for the obligatory wait period. But the guy in the video did not defend his actions on that clause. He just said the cat was too ill and that he did the right thing. Perhaps he was indirectly referring to the clause. The truth is that waiting 5 days would not have harmed. Almost certainly, the cat would have survived five days and the owner could then have dealt with her cat as she needed to. This is another case of an over-eagerness to kill shelter cats in my opinion and not do enough to find owners and rehome.